Always On Watch: Semper Vigilans: The Future Of The Democratic Party? If Joe Biden livestreams his colonoscopy, I’m quitting the internet. Meanwhile your party is snugly in bed with the Russians. You Trumpers sure are worried about the Dems which is VERY telling. The coup leaders in the FBI keep saying that... with no proof. Put up or shut up, oath busters! btw - Did Boston get any snow, pShaw? I think she meant to type "Patsy Mewler." Fits her much better. After two years of Twitter tantrums under our belt, I don’t see these idiot publicity stunts as accelerating our downward spiral. Thanks to several decades now of mass indoctrination by a perverted eductional establshment enamored of and corrupted by the moral rot of Cultural Marxism we've become a country with a comic book mentality –– no wiser, no more knowegeble, no more capable of deep thinking, and no more sophisticated than seventh and eighth graders engaged in a food fght in the cafeteria. Absolutely, now aided and abetted by two years of juvenile Twitter tantrums. Well, we'll justve to agree to disagree on that. I see it differently from you. I believe the president is fully aware how alarmingly "dumbed down" our nation has been. I believe he has very cleverly been able to bypass the enemedia by reaching out directly to The People using blunt language the rank and file can easily relate to and readily understand. As I see it, if Mr. Trump acted "presidential," –– meaning stiff, pompous, distant, quasi-erudite and rhetorically "eloquent" in ways that would please his critics –– i.e.the timid, unimagiative, self-serving stuffed shirts in the political establishment and the captious, arrogant, self-absorbed nitpickers in academia, the president would have had no success at all in reaching The People, snd would not have been able to do most of the good things he has in fact accomplished. Of course, I could be wrong, –– it wouldn't be the first time ;-) –– but so far I don't see any rreason to change my mind. I think many of our better educated people find themselves put off, even alienated, by the president's decidedly untraditional style. I was, myself, –– at first –– but I watched him closely all during the campaign and beyond, and have seen remarkaby good qualities in him that frankly surprised me. What we see on the surface –– and tend to dismiss too easily at first glance –– is often only the tiniest fraction of what is actually there. So, your premise is that since POTUS, with one of the largest pulpits in the world….where he controls the message through his staff, has had to take to airing his feelings on Twitter, and - he chooses juvenile taunts and lies to convey his message? Isn't he "speaking to YOU"....the "People"? Doesn't that either tell you the state of his intellect....or how little he thinks of your intellect? His "style" is not un-traditional in general......it's merely un-traditional for the leader of this Republic. Remember, when he lies….he’s lying to you as well. When he endorses the Soviet invasion of Afghanistan, based on his invented and false premise.......he is either ignorant, or he thinks you are. Say what you will about previous politicians, had any one of them lies to the faces of assembled uniformed service members in a combat theater, you wouldn’t have given them a pass.......you would have excoriated them as ignorant......or worse. If one can’t hold their own to account, there’s no point in holding the opposition to the same. Call it what you want C.I. Echo Schumer by saying he has "tantrums". It's entertaining, it's communicative and it's effective. And it gives you one more thing to complain about Trump. I'm pretty certain that I employed "tantrums" before Schumer started. And all of the "oh why, oh why...are they soooo meeeaaaan to Trump"...from the same crowd that STILL runs the "Obama Derangement Syndrome" industry.....is what is truly entertaining. WaPo fact-checks Trump’s boast burgers were piled up “a mile high” for Clemson reception. Seriously. "..,.we've become a country with a comic book mentality –– no wiser, no more knowegeble, no more capable of deep thinking, and no more sophisticated than seventh and eighth graders engaged in a food fght in the cafeteria." Agreed. And as a consequence, the country elected Donald Trump. "Honi soit qui ml y pense,"
The belligerence inhrent in arrant bigotry ill becomes the Left even more than it does its counterpart, El Clono. Sorry about Steve King (R - KKK), FreeThinke, you must be heart broken. NY Times needs to publish the entire transcript. King was nuts to speak to them without recording the whole thing. Agreed. If you ask "What's wrong with being white or a nationalist?" you will be described as supporting white nationalists. And the Repubs join the Dems in the contrived frenzy. The Clemson football team went to the White House to be honored for their winning, and were served Burger King, Wendy's and McDonalds Hamburgers, and Pizza! Fast food served at the White House for a hundred hungry Football players? ? That was just trashy and unacceptable! Where was the Lobster, Caviar, and Champagne that is generally severed by Nancy Pelosi, or Barrack Obama...An elegant food spread, not a Fast Food spread. Can you imagine the reaction of John Kerry if he were there! Many Democrats, Progressives and the rest of the Trump haters feel that Trump should have made better arrangements than just “Fast Food”! O.K. That’s it. They’ve finally worn me down. I surrender. Okay, that’s it, I’ve seen enough, let’s go ahead and impeach the M*F*K*R,, and return to a more sane, and more sense from our Government .and lets cancel the 2016 election and put Her Majesty Hillary Rodham in her rightful place as his replacement. I mean, Goodness Sake . . . look at the fine examples of we have had in the past, like Lyndon Johnson, John Kennedy, Jimmy Carter, Bill Clinton, and of course the Messiah Barrack Hussain Obama. With that level of inspiration in our past, we ought to be able to come up with a credible person in our White House who knows how to us the Handbook on How to serve a bunch of 18 year old College Football players. WHEN IF EVER WILL THIS END? He could have at least served food from Arby's, Chick-fil-a, or Nathan’s. If we are not going to spend our money on building the Wall, then we should be able to serve a more elegant mean to our countries best Football teams. "Oh look! My husband is here! Normally he can't stand to be around me." 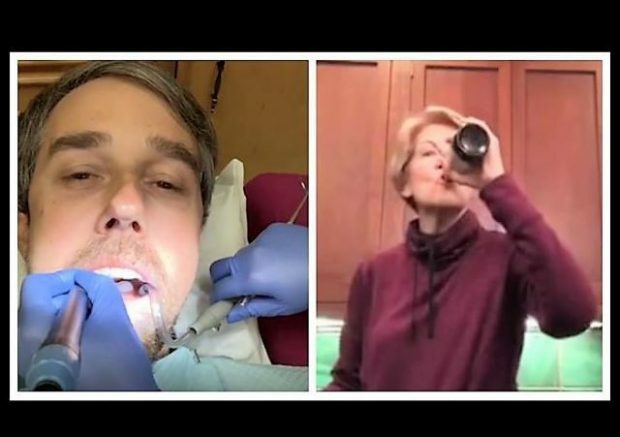 The best that I can say about the E. Warren video: tone deaf. Or, "Look! My husband lives here. I didn't know that." "Will there ever be anything positive said about President Trump during his presidency?" For a fat man, he doesn't sweat too much.